This is a very appealing theme and for me the idea of travel can be as simple as going someplace that you’ve always wanted to see. Whether it is traveling to a place that you’ve read about all your life or taking the opportunity to go somewhere new, both can be equally compelling. Tuscany was a place that I had wanted to visit and when I was actually there it was an unforgettable experience. Even now when I look at this particular picture I can recall the excitement of simply being there. More about this subject is here. This entry was posted in Italy, Travel and tagged outdoors, Tuscany. Bookmark the permalink. Talk about feeling like the world is at your doorstep! Spectacular photo, Meg. I love it. What a beautiful place. Your photograph of it is great Meg. Thanks Ruth – it’s one of my favorite memories of Tuscany! That’s an inspiring view! It’s the door frame! It was an amazing sight and those doors provided the perfect frame! It must be wonderful to see that view every day! Tuscany is really gorgeous and I know just what you mean! We shall be returning this Spring. Had to skip Europe this year, but loved our Canadian adventure. When I hear the word “Tuscany” I salivate just thinking about the food and wine………lol. Maslow would have loved me! Tuscany will be another wonderful adventure for you – there is so much to see and do (and eat and drink). It’s an ideal destination! This picture is amazing. You captured perfectly the feeling of awe when one travels. Exquisite. I feel as though I have just inhaled a huge breath of fresh Tuscan air. It felt very welcoming and I know what you mean – I’d like to be there right now! Tuscany is a photographer/foodie/wine-lovers dream! Gorgeous shot! Thank you Suzanne – it’s really a fantastic destination! It was a perfect day in Tuscany! That is an outstanding photograph Meg. 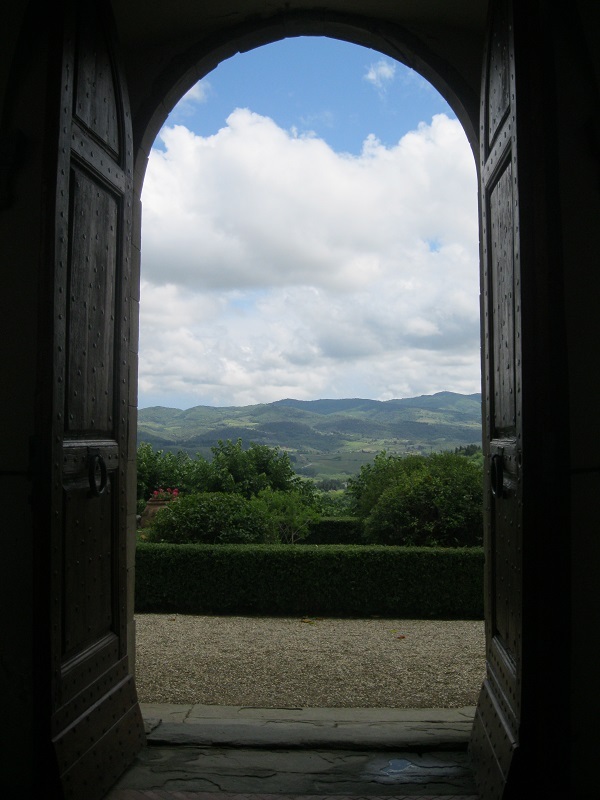 Thank you Karen – Tuscany is so incredibly photogenic! I totally agree and the light seems to be perfect for photographing the lovely countryside. You make a great point about the light there – if makes pictures even prettier! Love this photo. It captures the excitement I felt on my own visit to beautiful Tuscany. It had just stopped raining and there was a crisp, fresh scent (as I recall)! It was such an amazing sight! It is a wonderful theme, Meg. i like the idea of simplification anywhere I can locate it. :-) I can see why this photo inspires you and rekindles memory. I love it. It really is the opening to a story. I love Tuscany. Your photo is breathtaking! Thank you so much – Tuscany is just marvelous!